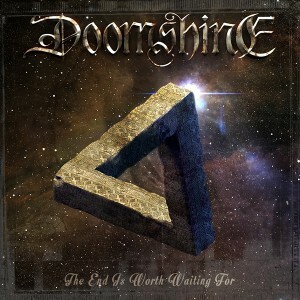 On August 31st the long-awaited 3rd album of DOOMSHINE "The End Is Worth Waiting For" will see the light of day. And we can say it was definitely worth waiting for! The new opus of these epic doom metal masters from Germany is full of beautiful and haunting melodies, musical, clean and smooth vocals with the most pleasant timbre, heavy as lead riffs, excellent musicianship, and a good variety of moods and tempos. Not to be missed by anybody who's into SOLITUDE AETURNUS, THUNDERSTORM, CANDLEMASS, SORCERER, PROCESSION, ISOLE and FORSAKEN. We also can't recommend enough following the lyrics while you're immersing yourself in these inspired sounds. You can find out more info about "The End Is Worth Waiting For" and see the high-res cover on the page of this release. "The End Is Worth Waiting For" CD can be pre-ordered from our SHOP page until August 31st, with 2 Euro discount. IMPORTANT: if you order it before August 25th, you can save also on the shipping cost, because we will send it from Germany. Pre-orders placed between August 25th and 31st will be sent from Italy, which is convenient only for Italian customers. As a special pre-order offer for DOOMSHINE we've added an option to add a CD of SESTA MARCONI "Where the Devil Dances" (doom'n'roll band from Italy, that unfortunately went on hiatus soon after this CD was released - you can listen to the full album here) for only 3,00 Euro! You can also pre-order the album as digital download (in lossless formats: FLAC, MP3 320 kbps and others) from our Bandcamp page. Later on, the album will be distributed digitally by CD Baby and made available also from iTunes, Amazon MP3, eMusic and other retailers.